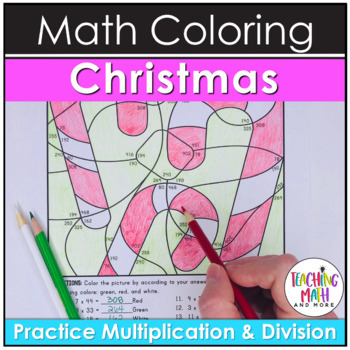 These Christmas Multiplication and Division Coloring Pages feature coloring problems to create Candy Canes and Christmas tree pictures. Students review multiplication and division skills. No prep, print and go for grades 3, 4, and 5. Aligned to math standards for upper elementary. *NO PREP, Print & GO Activities! (Only materials needed: 3-5 different colored crayons or markers, and a pencil). *Engage your students in Math for Christmas! LEAVE FEEDBACK on this product and earn 4 TPT credits to use on future purchases! FOLLOW ME to get new product notifications, SALE notices, and freebies! For more teaching ideas visit www.kellymccown.com.